Our nighttime temperatures settled into the 60s last week, so we could finally plant the basil, peppers, eggplant, and beans. My favorite kind of bean is the very thin French type, aka fillet beans, and we decided to try growing them last year. We planted the Maxibel variety of fillet beans and the plants sprouted just fine, then we agonized as two full rounds of bean seedlings were devoured by ravenous bunnies. 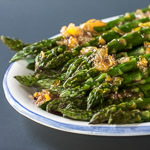 We never got a single French bean (or snow pea or sugar snap pea or yellow bean), and the only bean plant they didn’t touch was the asparagus beans. This year we are better prepared after 99% bunny proofing the yard, but of course there’s always a flip side: the bunnies are now terrorizing our neighbors. 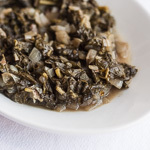 Green beans aren’t just for autumn. You can plant them in late spring to early summer, keeping in mind the nighttime temperatures, and depending on the type of bean, you can begin harvesting in as early as 50 days. 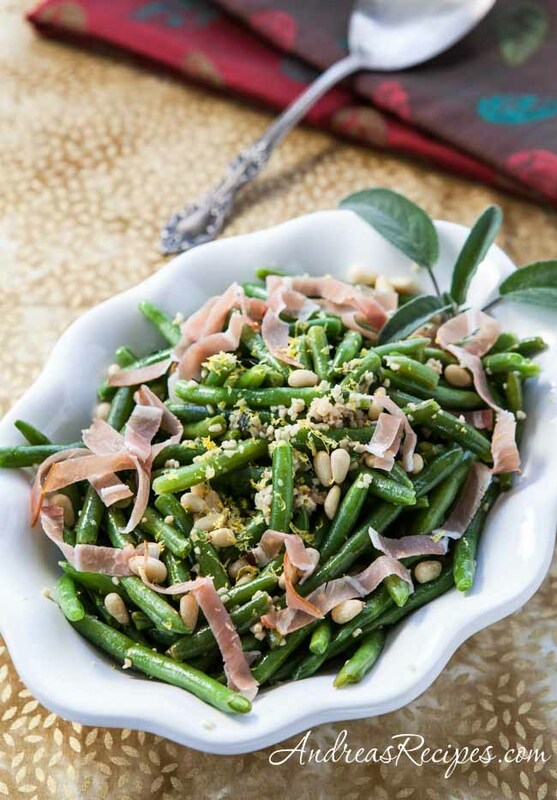 This dish is one of my favorite ways to prepare green beans, and even though the sage in the recipe may make you think of autumn or Thanksgiving, it really is beautiful with the lemon flavor in these beans beans any time of year. 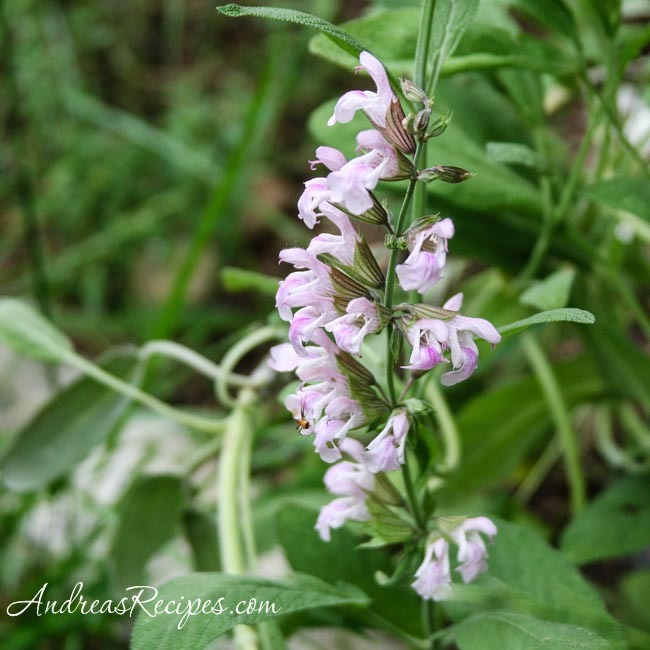 In fact our sage is full and bushy and in bloom right now with beautiful pale lavender colored flowers. My friend Diane runs the blog The W.H.O.L.E. Gang, and she came up with a wonderful idea to get bloggers together in honor of Jamie Oliver’s Food Revolution and have our own 30 Day Food Revolution. 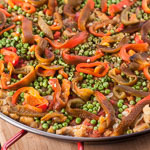 Bloggers from all over have been sharing their tips for cooking real food and living a healthy lifestyle, and I’m honored to share my tips with her readers. 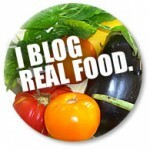 Make sure you check out all the food revolution posts on Diane’s blog, there’s some wonderful stuff there. Bring about 3 quarts of water to a boil. Add the beans, return to a boil, and simmer until crisp-tender, about 3 to 4 minutes. Drain and set aside. Heat the olive oil over medium heat. Add the beans, garlic, sage, a pinch of the salt and several grinds of pepper. Cook, stirring occasionally, until the beans are browned in places, about 3 to 4 minutes. Stir in the pine nuts, lemon zest, and prosciutto. Season with lemon juice and zest, and add more salt and pepper to taste. I can almost taste these green beans! Thanks for the inspiration. I love living in the mountains, but this time of year I get so jealous of the gardens! It would be so great to have one, but our growing season is so short (just snowed all last week) and the soil here isn’t ideal … not to mention backyard bunnies, coyotes, and deer everywhere! But, I can still do that recipe with some CSA green beans (fertile lands are just a short drive past the mountain 🙂 It looks fabulous! Wow, I am so glad you posted this recipe! I just printed this recipe and will be buying the ingredients for dinner tonight. Great recipe. Sarah, Alisa, Kelli, Shannon: I hope you enjoy the beans! Sharlene: True, but I still feel for our neighbors when their flowers are eaten by the ravenous bunnies.